I cross-posted the video from Vimeo to Flickr and now I’m sending it back to WordPress, since wordpressdotcom hates Flash embeds. This was a great show last week at the Masquerade, and my first time going there. The band is playing string metal. Here, the encore features a Metallica cover. Too bad I was sick and running a bit of a fever, as they had no air conditioning. I felt sort of like I was going to pass out, and my brainz were on fire. Oh well, it was a good time. Nothing Else Matters, originally uploaded by N-Sai. 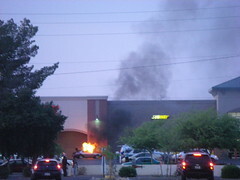 I shot some pics of a car fire out by the Wal-Mart Supercenter at 51st Avenue and Indian School Road when I was out with the fam in West Phoenix last week. It was a pretty random thing. I feel like I’ve been taking a lot of pictures, what with the recent tornado incident back here in the ATL. Yeah, that tornado was an amazing feat of natural havoc.